The deeper one looks into nutrition, the more complex it becomes. Balancing the numerous priorities we are told we should have, such as eating foods that are high in antioxidant levels, they need to have the right fats in the right amounts, they need to provide us with energy but also help us recover from workouts, etc. It is very hard to pinpoint the right foods to cover all these bases, however, there are a couple of basic principles you should ask yourself in order to determine if a particular food should be consumed; does it have a TV commercial and/or would my great-great grandmother recognize it?If the answer to either of these questions is yes, stay away! If you apply this test to Lard, it passes! But haven’t we all heard it’s bad? The name itself sounds like a heart attack waiting to happen. Why? It’s a interesting story. In the early 1900’s the major U.S. company Procter & Gamble was in the business of growing cotton… it was very profitable for them. However, there was a bothersome by-product, cottonseed. Procter & Gamble made the smart business decision to investigate if they could do anything with cottonseed to turn this by-product into a revenue stream. They found that after intense processing they could extract an oil from the seed (it easily turned rancid and was a very unstable fat)… so they hydrogenated it and found that it now had a long shelf life and when it cooled it looked and acted like lard. They decided to call it Crisco. Unfortunately, Crisco is not lard but got lumped into it an became synonymous (very undeserved). Lard is simply pig fat taken from any area of the pig that has a high concentration of fatty tissue. Lard (in its natural form) has no trans fats, is high (50%) in mono-saturated fat and contains (40%) saturated fat. Saturated fat was once the enemy of nutritionists, however, more recent study’s have turned that on its head with modern research pointing out that saturated fat (when combined with a low carb and sugar diet) can raise HDL cholesterol. If cholesterol is still a concern of yours, the amount of cholesterol in lard should be put into perspective; lard contains about one third the amount of cholesterol as butter. You would need to consume a whole cup of lard to equal the cholesterol from just one egg. 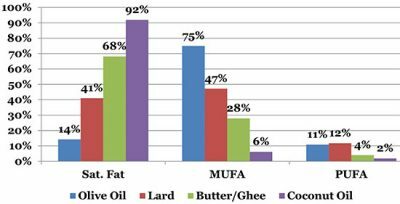 The below chart compares the level of Saturated fat, Mono-saturated fat and poly-saturated fat in Olive oil, Lard, Butter and Coconut oil. You will notice that two of the most fashionable oils right now in nutrition are polar opposites. Olive oil is almost all saturated fat with almost no mono-saturated fat. Conversely, Coconut oil is almost all mono-saturated fat with almost no saturated fat. Lard is the only one to offer both of these healthy fats in moderation. One of the biggest benefits of lard verses other oils is its high smoke point, creating lower levels of aldehydes (which are a concentration of chemicals that are produced when oil is heated up an starts to break down). This high smoke point results in less free-radicals being consumed into our body. Lard is also a good source of vitamin D, which about 42% of U.S. adults are deficient in. One important thing to remember is how to identify real lard from the imitations: Lard that is solid a room temperature and/or does not need to be refrigerated DOES have trans fat and does NOT have vitamin D.
Most farmers who raise pigs can help you get lard, but if you don’t happen to live next to pig farm, lard is easy to make! Ask your butcher for some back fat, leaf lard or simply use any pork bacon or pork belly, cut off the fat and render it by cooking it slow over the stove (very low temperature) or in a 250 degree oven for about 6-7 hours. Strain and chill. You now have lard!